Drug ototoxicity, especially in psychosocial problems, limits the quality of life of patients after treatment, those with serious consequences. The use of platinum derivatives and aminoglycosides is associated with permanent loss of hearing, although many medications have improved after discontinuation of treatment. In the literature, a number of compounds have been identified as ototoxic. The degree or incidence of ototoxicity can vary widely between drugs, and sometimes a drug can be listed as possible ototoxic if only one ototoxicity is suspected. Even among agents known to be ototoxic, the incidence of ototoxic hearing loss may be so low that official ototoxicity monitoring may not be recommended. In particular, patients who have previously experienced a problem with the inner ear, who have tinnitus (with neural type - sensorineural hearing loss), should avoid these medications as much as possible. 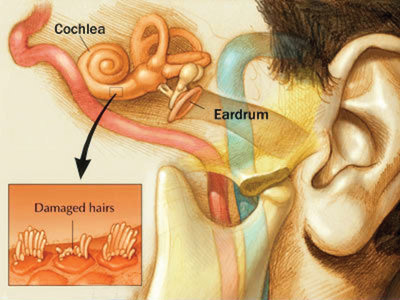 Sensorineural hearing loss (SNHL) is a common sensory deficiency characterized by tissue damage and / or cell death in the cochlea. Moderate and severe SNHL cause deficiencies in communication, cause more isolation than human relations and negatively affect employability. Many etiology are associated with SNHL: Noise over-exposure, some drugs, internal or middle ear infection, or immune-induced inflammation are common. However, the most common form of SNHL is presbycusis or age-related hearing loss, often exacerbated by other factors such as noise exposure, diabetes, or high blood pressure. Although systemic steroids have been used in the treatment of sudden SNHL, other drugs have not yet been developed to prevent or treat hearing loss. The cochlear sensory cells known as cochlear hair cells (HCs) and neurons have a very limited repair capacity. Moreover, since these cells are not regenerated, any loss is permanent and therefore the prevention of cell damage is critical in maintaining the hearing (sources >> Screening antioxidants for the protection of cochlear sensory cells / The role of oxidative stress in noise-induced hearing loss). Drugs that damage the inner ear can be classified as "harmful" and "potentially harmful". This drug can also be listed as drugs that can cause tinnitus. A significant change associated with HC loss is the accumulation of intracellular free radicals. The formation of ROS and reactive nitrogen species (RNS) in cochlear cells is triggered by exposure to loud sounds or ototoxic drugs, and often leads to programmed cell death. ROS is normally produced in cells and has specific roles in metabolism, cell signaling and other processes. However, excess ROS can lead to cell damage and death. Excessive ROS and RNS DNA damage proteins, cytosolic molecules, cell surface receptors and membrane lipids. ROS also leads to inflammation and production of pro-inflammatory cytokines such as interleukin-6 or tumor necrosis factor-a (TNF-α). The presence of vasoactive lipid peroxidation products, such as isoprostanes, may reduce the cochlear blood flow. All these changes may contribute to HC death and to SNHL (sources >> HEI-OC1 Cells as a Model for Investigating Drug Cytotoxicity / of beta-catenin by inhibitors of glycogen synthase kinase-3 ameliorates cisplatin-induced cytotoxicity and pro-inflammatory cytokine expression in HEI-OC1 cells / Chemical and molecular mechanisms of antioxidants: experimental approaches and model systems). Can ototoxicity be prevented by using antioxidant drugs? Numerous experimental studies in animals have shown that exogenous antioxidants can effectively protect HCs from various forms of damage in vitro and in vivo. Reactive oxygen species are important components of ototoxic damage to hair cells (HCs) and occur in the early stages of the damage process. Higher levels of natural antioxidants are positively associated with resistance to ototoxins, and many studies have shown that exogenous antioxidants can protect HCs from damage. However, there are not enough clinical studies in humans to prevent internal ear damage by using antioxidant products; In the study called "An antioxidant screen identifies candidates for protection of cochlear hair cells from gentamicin toxicity", an antibiotic with an ototoxic properties, Gentamycin was used to prevent internal ear damage and 13 of the 81 antioxidant components were significantly protected. These include various classes of antioxidants which have been previously tested on HCs, which have various classes of genetic antioxidants, which are useful for modifying the effect of gentamicin damaging. From this study, an antioxidant that could reduce the internal ear damage caused by drugs on humans was not emphasized and it was stated that further clinical studies were needed. Although some antioxidants may appear to be suitable candidates for protection of HCs from ototoxic drugs and oxidative stress associated with potential noise or aging; These should be confirmed by further study and in vivo testing. It will not be scientifically correct to defend the antioxidant drug-alone products as side-effects and useful. In summary, if you have a hearing loss in your ear if your ear has a neural type of hearing loss, if there is ringing in your ear as a result of the use of a drug, if there is hearing loss due to atelchic disease, and if there is hearing loss in your ear, avoid using ototoxic drugs if possible. If you have to use medication that kills the inner ear, do not use a medicine or prescription medicinal product that you consider to be protective, without consulting your doctor. There are also studies suggesting herbal products and foods such as lemon peel (containing lipoflavonoid), garlic, omega-3 fatty acids, ginkgo biloba (sources >> Cochlear hair cell regeneration after noise-induced hearing loss / The efficacy of Ginkgo special extract EGb 761 in patients with tinnitus / Ginkgo biloba for tinnitus (Review) / Fish Oil & Tinnitus / Can Lipoflavonoid Stop the Ringing in My Ears? / Drug-induced hearing loss. - NCBI).